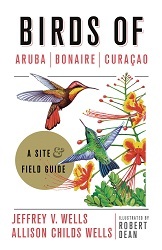 OUR NEW BOOK HAS EVEN MORE INFO ABOUT ARUBA. ORDER IT HERE! Whether you've already booked your resort or not, we recommend that you read through the trip reports posted on this website. These are provided by by like-minded people (read: bird-brains, or at least birding half-hardies) who have generously taken the time to share their experiences. Some of these reports include information and comments about where they stayed. These comments can be very helpful when choosing from the wide assortment of hotels, resorts, and restaurants—and especially, where and when various bird species were found. You can get all of the tourist basics by visiting http://www.aruba.com—resorts, restaurants, shopping, weather, events, water sports, just about everything about the most important basics except: BIRDING! Go ahead and visit their web site, but come back here for your basic island birding info.